I Just couldn't resist posting this picture, my son took, of his little daughter (our adorable granddaughter). I think the little doll bed was a hit for Christmas. 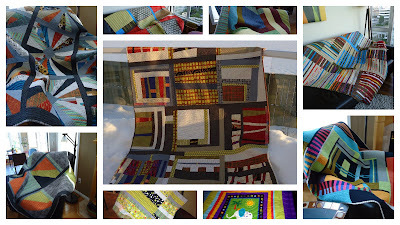 I'm happy to say, despite the many starts, I also finished a few quilts this year. 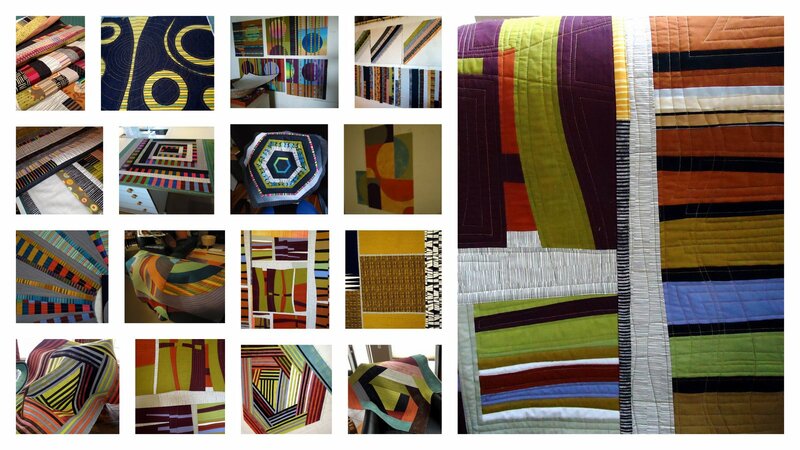 I was also delighted to realize I had fulfilled last year's quilting and blogging goals. So what 's up for 2012....much of the same I hope. 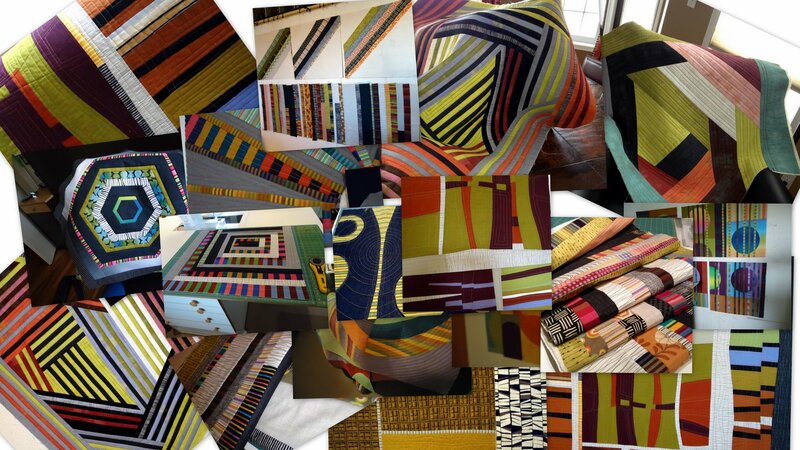 Here are are a number of projects scattered, throughout my studio, that I started in 2011, but have yet to finish. 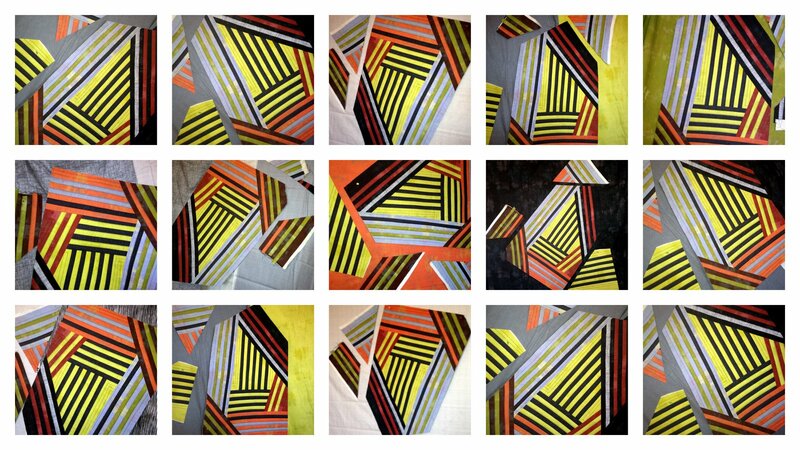 This scattered mosaic is a more accurate photo, of the jumble going on, in my studio, alright I admit, in my head as well. Hmm...rather scary what a scattered brain looks like. I might even have missed a few. I'm happy to report that I did have a few finishes as well....I'll gather them up for a grand New Year's Post. It's official I've been blogging for exactly one year....time to take inventory. I remember how fearful I was pushing the publish button, for my first post. If it hadn't been for Lynne of Lily's Quilts I might never have...she gave me the nudge I needed. To think I might have missed out on this experience...so thanks again Lynne. I have found a wonderful sense of community......when everyone else gets tired of the quilt talk, somehow you guys never do. 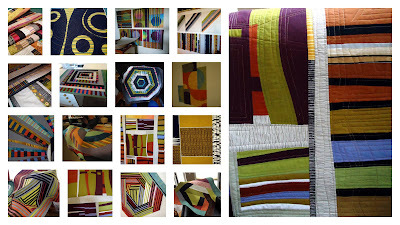 I'm quilting more...seriously my production is up, at least the starts are, I'm not so sure about the finishes. No, actually I think they are up as well. New friends...from all over the world, including, my own city. I'm more motivated to push myself artistically...I love showing you my work and you help motivate me to continue on. Most of all I'm still amazed that you read and comment...and all your comments are so supportive and positive and best of all you often make me laugh...fall off my chair laughing. So happy to say, there is nothing, under the cons list. Seriously you've all been so wonderful. Am I up for another year? ?....you bet I am. Have I felt pressure, keeping up with it? ?...I can honestly say no. The pleasure far outweighs the work. Thank you for letting me share a piece of my life with you. From my the silliness, to the fabric addiction, to the artistic endeavors and back again. I know many of you, do give aways, for occasions, such as this, but I thought I would follow Leanne's (She Can Quilt) lead and make a donation to my favourite charity instead. One of my favorite Charities is World Vision....I'll be calling them next week, to sponsor a child, in celebration of one year of blogging. And because I can't have a post without some pictures, here is my finished baby quilt....that I started late, yesterday afternoon. Whoops, I photographed the giraffes upside down. Time to get back to some more adult type projects, although the kids stuff has been fun. As if I don't have enough on the go, I thought I would quickly put together a small quilt for my little grandson, who is due this spring. After all, I had four pieces of Minky left and the operative words are small and quickly. It's not like I had to go shopping for fabric or anything. These little stuffed animals came with, two squares of Minky......you are actually supposed to cut the animals in half and sew them to the fabric some how. Yikes, that's not happening in my studio. I used two for doll quilts and joined the remaining four and made a small baby quilt. I also made pillows and mattresses for my little doll beds. All I have left to do is the binding on the baby quilt and I'm done....so happy. All that and I still had time for a Christmas lunch with my fellow blockheads....some days are just way more productive than others. I'm motivated because my daughter flies in from Montreal tomorrow and she takes after her father (Mr. Christmas) so there could be a flurry of activity around here for the next ten days...I can't wait to see her. Now that I've eradicated sort of eradicated my Christmas Crabbiness and accepted the fact, that Christmas is just around the corner....I decided to have some fun. These little guys need quilts!! And all from my stash! 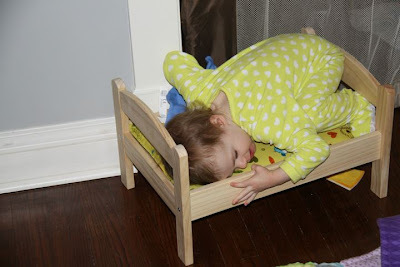 My little granddaughters will be two this spring....and love putting their toys to bed, so little beds, from Ikea, and quilts it is. I have to admit Christmas does put me into Grandma mode. This is the only Christmas sewing I'm doing....no pressure just fun stuff. Funny it seems just like yesterday, that I was doing this for my daughters, when they were small. 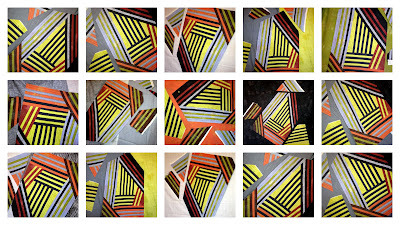 I have ideas for these scraps, so I'm purposely creating larger ones than necessary. Meanwhile this seems to be morphing into one giant, wonky hexagon. 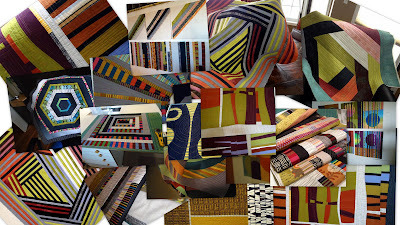 Often, as I'm working on one quilt....ideas for a next one start formulating. It's almost like one quilt spawns another...does this happen to you? I'm sorry to say this .....I get a little crabby around Christmas. I'm one of those people, that love normal, everyday normal. Don't get me wrong, I love spending time with friends and family but for some reason, I find the Christmas season a bit overwhelming....alright a lot overwhelming! I had lovely family Christmases growing up, as a child, so no difficult history to blame. Of course, it goes without saying, that this Mrs. Scrooge is married to Mr. Christmas. Why is that? It must be the same phenomena that pairs morning people with night owls, messies with neat freaks, introverts with extroverts and on and on. So what do I do to counteract my crabby ways? In the practical realm, I've simplified. Name drawing for gifts, the less is more philosophy for decorating etc. Does that help? It does relieve some of the stress but, as I was telling whining to Mr. Christmas this morning, I still have to work at fighting the general sense of..... what the bleep bleep, it's Christmas AGAIN!! I'm sure most of you will want to smack me when you hear that darling Mr. Christmas cooks the dinner and loves loves wrapping all the gifts. Trust me, you are not alone in that...my friends have actually used the word spoiled in describing me, imagine that. He's singing in the kitchen as I write. Trying to match Mr. Christmas's mood , off I went, to get some of my own Christmas cheer. Hmm, is it hiding in this little mini Ginger Bread House...that Santa does have a bit of an ominous look about him, don't you think? Even a trip to my local quit shop didn't do the trick.....believe it or not, that 's all I came home with. One of the best ways to keep myself grounded during the holidays is to KEEP QUILTING. I used to put it all aside, during the season, resenting every every minute of it. Creating calms me! So instead of cleaning it all up I keep it going. The one thing I don't do, is have a lot of projects with deadlines.....there might be a few small ones at most. I want my studio to be a place of refuge and creativity, not a hotbed of stress. In the calm of my studio....I reflect on all wonderful things in my life. At the top of the list are my two adorable granddaughters and my little grandson, due this coming spring. I pray, that rather than turning into a cranky mess, I can embrace the goodness of God's love, this Christmas season. P.S He's still singing in the background....off key I might add. I just might have go over and smack him...whoops sorry about that, old habits die hard.